Avis Car-Away, founded in 1979, is the leading motorhome rental company in France with nearly 40 years of experience in renting out motorhome, offering a wide range of motorhomes, perfect for travelling anywhere in Europe. Since 2017 Avis Car-Away is part of the French PILOTE-Group. 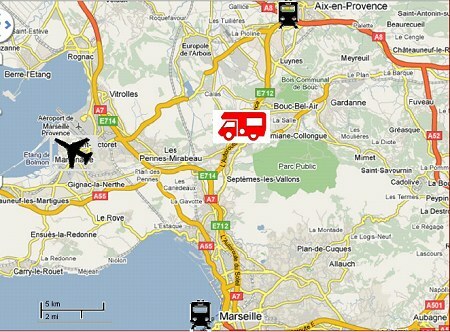 Wide selection of depots around France and Corsica and international one-ways are possible. Book online a request for an international one way rental out of France from Paris and Marseille to 10 other European cities in 5 countries. 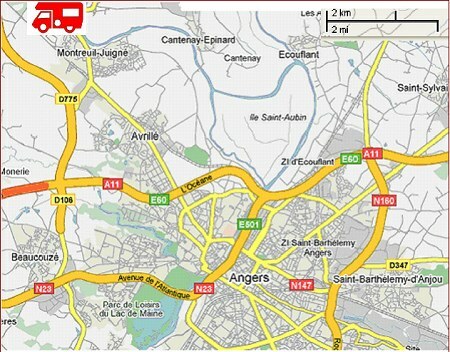 Avis Car-Away offers a large variety of campervans and motorhomes. The vehicles in their fleet range from a 2-Berth Camper Van to spacious 6-Berth Motorhomes. 80% of their fleet is renewed every year. * You are required to return the vehicle with a clean interior and the toilets and grey water tanks emptied. Otherwise, a cleaning fee of € 100 will apply at drop-off time. 5% for all hires of 21 days and more. When calculating the total price all rental days are added up according to the number of days that fall within each 'season'. The pick-up and drop-off days are counted as one day in total (as long as the vehicle is not returned at a later time than on the pick-up day, i.e. the rates are charged on a nightly basis in the same way that hotels do this). If the rental vehicle is returned at a later time than the time at which is was handed over the rental company charges an extra day at drop-off for units of up to 2 hours' delay. If you wish to drop off the vehicle at a later time than the time which you will pick it up please specify this in the notes section of the online booking and an extra day will be charged on top of your calculated booking at the current rental rates. Otherwise, we will book on a nightly rental basis as quoted online. Please take a close look at the pick-up and drop-off times in the 'Pick-up / Drop-off' section below. If the limited kilometre option is booked, any kilometres that you drive above your limit will cost € 0.35 and are payable locally. One-way rentals (vehicle pick-up at location 'A' and drop-off at location 'B') within mainland France are only available if reserved in advance with your booking and for a fee. One-way hires between mainland France and Corsica (or vice versa) are not allowed. For international one-ways the exact drop-off address will be discussed in advance during your request or pick-up of your vehicle in Paris or Marseille. An Avis Car-Away employee will be meeting you at the drop-off location (usually at the international airport or at a hotel) to collect your vehicle. Avis-Car-Away does not provide transfers. You are required to arrange these yourself. In Paris from the airport (Charles de Gaulle or Orly), Eurostar Gare du Nord station and other Paris main stations or city hotels to the Paris depot and from the depot to one of these locations after drop-off, as long as this is requested during the booking process. A later request is deemed an amendment. In Ajaccio from the airport, train station, ferry terminal or hotels in Ajaccio area to the depot and from the depot to one of these locations after drop-off or to/from Bastia, Figari, Calvi on request as long as this is requested during the booking process. A later request is deemed an amendment. You can see the transfer prices during the online quoting / booking process on our website where you can select a certain transfer and recalculate the total price. If you require bikes, surfboards, or other large items to be carried as part of the transfer, the respective rate will increase. Please note that normal taxis are not able to transport these bulky items. Please infom us at the time of booking if you plan on taking any such oversized luggage with you on your holiday so that we can book an appropriate transfer for your needs and avoid problems on your pick-up day. If you have booked a transfer you will need to call the rental depot the day before your pick-up date to arrange the transfer time and meeting point. The optional extras listed below cannot be booked in advance. They can be requested at the time the booking is made with us and we will pass on the request to Avis-Car-Away. All extras are pending availability and are payable locally at pick-up time. Third party insurance is included in the rental rates providing cover in the event of a fire or explosion up to € 760,000 as well as unlimited cover for claims made against the renter if third parties or their property are injured/damaged. You have the option of purchasing the supplementary CDW Insurance option for € 10 per day. The CDW insurance reduces the excess to € 800 per incident. Please note, the CDW does not cover damage caused by frost, damage to the interior of the vehicle, radio, tires, wheels, side mirrors, glass damage (windscreen, windows), electronic devices provided by Avis Car-Away (e.g. GPS, TV, antenna), damages to the roof, damages caused by striking objects/trees, vandalism and theft of personal property. The excess applies separately for each individual incident where damage is caused. If you purchase this you will be provided with a 24hr emergency hotline service including assistance if you suffer a mechanical breakdown (for further details/exclusions please refer to the section 'Miscellaneous' under 'Breakdowns & Repairs') or an accident which is not your fault. The rental company will reimburse you for towing, transportation costs or any relocations to a rental depot as well as accommodation costs (up to max. € 38 per person per day). The insurance covers you in all countries listed in the insurance green card provided which includes most Western and several Eastern European countries. Please note that malfunction of radio, air-conditioning, refrigerator, propane gas and 12 V appliances are NOT considered mechanical breakdowns. For a list of damage incurred that is not covered by any insurance - including the CDW and PAI supplements - please see the section 'Insurance Exclusions'. Note: Every self-inflicted accident or accident caused due to non-compliance with the law or rental agreement which results in the vehicle not being usable equates to an early end of the rental. This is viewed irrespective of which insurance category has been chosen by the renter. No refund for unused days is provided nor is a vehicle replacement possible. A deposit of € 2,000, or € 1,000 if the standard excess has been reduced, is required in credit card form (Visa, Mastercard or American Express only) at pick-up time, otherwise the vehicle cannot be handed over. The deposit amount is taken as an authorisation on your credit card at pick-up time, but is not deducted from the card. The deposit applies on a per-incident basis. If there is an accident, a further bond is taken for the remaining rental days to cover the excess for any further incidents. It is reimbursed in full as long as the vehicle is returned undamaged, clean, the fuel tanks are full (not the propane gas tank) and the toilet and grey water tanks emptied. The rental company reserves the right to charge fees for damage, post-hire cleaning, a late drop-off, fines or parking tickets, etc. Any such fees are deducted from your credit card or offset the reimbursement of the deposit. If an accident occurs with an uninsured driver or if another driver flees the scene of an accident the renter is liable for the full amount of the excess. The excess is always banked in the first instance in the event of damage and/or and accident, regardless of who is at fault and is owed to the rental company by the renter. The excess is refunded as soon as the rental company receives a payment from a third party. This can of course take some time. All insurance cover will be null and void if the terms of the Avis Car-Away rental agreement are breached. Any damage that is caused if the renter acts outside of the rental company conditions is not covered by the insurance. Any water and/or saltwater related damage where the renter is at fault is not covered by the insurance. This includes any damage to the underbody, roof or roof appendages. - damage to the interior of the vehicle, including electrical appliances such as radio, GPS, TV, microwave, etc. If speeding tickets and parking or toll road fines and/or accidents, etc (e.g. that have not been mentioned to the rental company) come to light the rental company reserves the right to invoice or charge the customer for these costs in arrears as well as a processing fee. If you are involved in an accident with another vehicle you are required to fill out the original accident report (in French) which is in your user's manual. Do not use the copy in English. The renter is liable to pay Avis Car-Away a € 40 administration accident fee (per accident). If the renter is not responsible, this fee will be refunded. All drivers must have held their licence for a minimum of 1 year for the respective vehicle category being booked. Standard national driving licences, e.g. UK and European Category B licenses are valid as long as the details on the licence can be read in English, otherwise an international driving licence is recommended, but this would still need to be presented at pick-up time along with the normal driving licence. The renter is liable for the actions of the other drivers as well as his/her own. The minimum age for any registered drivers is 23 years. All registered drivers must have been in possession of a valid national driving licence for at least a year prior to the pick-up date. There are no additional driver fees. Any person wishing to drive must have all of his/her details entered in the rental agreement. The renter is required to have access to the name and address details for any person who drives the vehicle - even if they drive for a short amount of time, and to provide these details to the rental company upon request. The renter is responsible for the actions of all registered drivers. Please note that a maximum of two drivers can be registered per motorhome. Before you can collect your vehicle you are required to present a valid driving licence, credit card (Visa, Mastercard or American Express), your passport and the Motorhome Bookers voucher at the depot. Please note carefully the maximum number of passengers allowed per vehicle as per the details provided when you view the vehicle specifications on the 'Vehicle Overview' page in the Avis Car-Away section on our website. The compulsory vehicle preparation fee (automatically factored into the total price when you calculate a quote/booking on our website) includes a handling fee and also provides you with a full tank of propane gas (1 full and 1 half-full bottle) as well as toilet chemicals (1 bottle). This is provided in addition to the standard vehicle equipment which is included in the rental rates. Brush, dustpan, electric cord and European adaptor, jerry can, coat hangers, fresh water hose, spare fuses and bulbs, fire extinguisher, multilingual instruction manual, campground guide. Crockery, cutlery and cooking utensils for 4-6 people (depending on vehicle size), i.e. plates, cups, glasses, knives, forks, spoons, bowls, can opener, bottle opener, corkscrew, pots, pans, platter, strainer, matches, etc. Please note that neither bedding, towels, camping tables nor camping chairs are included in the rental rates. Bedding including 1 towel and camping tables can be rented for additional fees (payable locally) at pick-up time. Bikes are not available for rent. For further details please see the paragraph ‘Optional Extras’ below. The optional extras listed below cannot be booked in advance. They can be requested at the time the booking is made with us and we will pass on the request to Avis-Car-Away. All extras are pending availability and are payable locally at pick-up time. They remain the property of Avis Car-Away and must be returned at drop-off time. * The bedding set consists of the following items per person: 2 bed sheets, 1 pillow, 1 pillow case, 1 blanket, 1 towel. Children under the age of 12 or children who are below 150 cm tall are required by law to be seated in a child seat. For children between 6 and 12 years a booster seat is adequate as long as the seatbelt fits them. This rule applies for baby seats and booster seats to ensure that the 3-point seatbelt fits tightly, regardless of whether the child is seated in the front or rear of the vehicle. Price per hire: Baby/Booster seat: € 5 per day. Max. € 100 per rental - payable locally. Please provide us with the age, weight and height of your children, if you require a baby- or booster seat. These must be booked in advance at the same time as the motorhome. All above items remain the property of Avis Car-Away France and must be returned with the vehicle at drop-off time. The vehicles are only permitted for use on sealed, public, official roads and should only be parked at secure parking areas/campsites. You can drive your motorhome within Europe at no extra cost. You are permitted to drive to Austria, Switzerland, Belgium, Germany, Netherlands, Italy, Spain, Portugal, United Kingdom, Ireland, Luxemburg, Norway, Sweden, Finland, Denmark, Greece, Hungary, Czech Republic, Slovakia, Croatia, Poland, Slovenia, Latvia, Estonia and Lithuania. You cannot - even if you have additional insurance - take an Avis Car-Away motorhome to Northern Africa nor some other Eastern European countries. Anyone who drives on unsealed or prohibited stretches of road or to forbidden areas or countries does so at his/her own risk. The renter is liable for any costs of repairs, personal injury, retrieval or towing that are a result of break-downs or accidents in these areas and no insurance cover is provided. The vehicle is also not allowed to come in contact with salt water. Please note that if you have an accident or breakdown in Eastern European countries it can be more difficult to obtain prompt assistance than in other European states. It is strongly recommended that you contact an automobile association or the respective national authorities of the given country with respect to that countries special laws that apply if you plan travelling there. One-way rentals (vehicle pick-up at location 'A' and drop-off at location 'B') within mainland France are only available if reserved in advance with your booking and for a fee (payable locally). One-way hires between mainland France and Corsica (or vice versa) are not allowed. 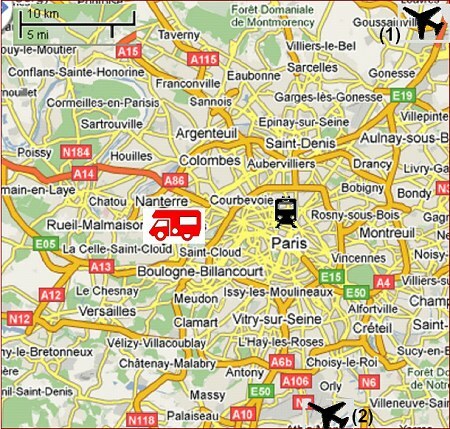 One-way rentals from the Paris or Marseille depot to the following major European cities are available on request and for a fee (which will be automatically factored into the online quoting / booking process and are payable locally at pick-up): Rome, Milan, Venice, Madrid, Barcelona, Munich, Frankfurt, Berlin, Zurich and Amsterdam. A minimum hire period of 14 days applies. For information on one-way fees please refer to the 'Additional Costs' section. All of the rental vehicles can be driven in winter. However, they are not equipped with winter tyres. You can order snow chains for a fee when you make your booking. In the winter months the facilities such as shower, toilet, etc can be used. Please note, however, that there is no insurance cover provided if any damage occurs as a result of freezing, etc, e.g. if you do not maintain a high enough average temperature in the vehicle to avoid damage to tanks, water heating apparatus and hosing this will count as negligence and there is no insurance cover then provided, i.e. the renter will be fully liable to cover all costs incurred. If it is likely that you will experience temperature levels below zero and you are unable to keep a high enough temperature in the vehicle, all connections such as water and chemical tanks may need to be emptied and no water in the vehicle is available for use. The renter is then required to purchase his/her own bottled water (e.g. drinking water) and to cover these costs him/herself. Ajaccio (Corsica), Angers, Lyon, Marseille, Nantes, Nice, Paris, Toulouse, Tours, Bordeaux, Grenoble, Ste Maxime and Strasbourg. 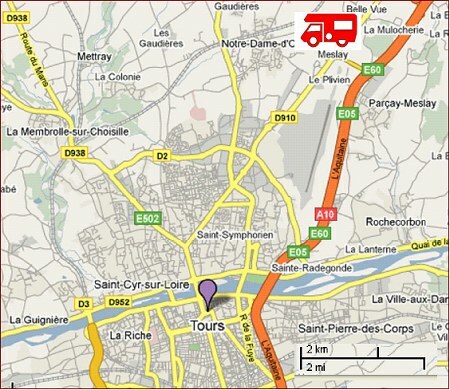 You can see the address of each rental depot in France by clicking on the city in question on the 'Rental Depots' map in the Avis Car-Away section on our website. Rome, Milan, Venice, Madrid, Barcelona, Munich, Frankfurt, Berlin, Zurich, Amsterdam. NOTE: All depots are closed on Sundays and public holidays. No pick-ups and drop-offs are possible on these days. 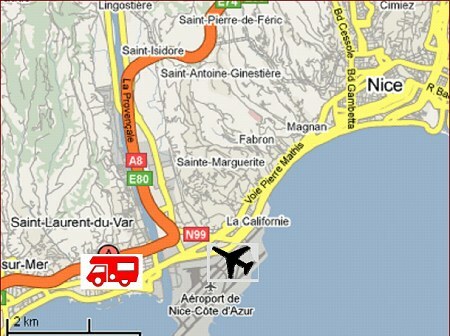 On Sundays, pick-ups and drop-offs are only possible in Ajaccio and for an extra fee of € 50 per pick-up/drop-off. Drop-offs on Saturdays are not permitted in July and August. In July and August there are also no pick-ups allowed on Saturday afternoons. You can pick up your motorhome at the booked depot and on the booked day (Monday to Saturday). - In July and August there are no pick-ups allowed on Saturday afternoon. Please allow for approx. One hour for the Avis Car-Away staff to provide a details explanation about how to use the vehicle and watch a 10-minute video. Please note this into your time planning and arrive towards the beginning of the pick-up time slots for the respective depot. No pick-ups are possible after 1630hrs. The vehicle explanation and handover with the depot manager is only available in either English or French. The renter is required to take the time to receive the vehicle explanation by the Avis Car-Away experts at the depot before departing in the motorhome. Avis Car-Away can withhold vehicle handover if anyone refuses to receive the explanation and accepts no responsibility for any delays at pick-up time that may be incurred as a result. You can drop off up your motorhome at the booked depot with a depot staff member. If you wish to drop off the vehicle at a later time than the time which you will pick it up please specify this in the notes section of the online booking and an extra day will be charged on top of your calculated booking at the current rental rates. Otherwise, we will book on a nightly rental basis as quoted online. Drop-offs are available as follows only. Please note that it is not possible to drop off your vehicle on a Sunday or public holiday and in July and August drop-offs are not possible on Saturdays. If you book an international one-way to another European city the exact details for drop-off will be discussed in advance during your request or during the pick-up your vehicle in Paris or Marseille. An Avis Car-Away employee will be meeting you at the drop-off location (usually at the international airport or at a hotel) to collect your vehicle. No refunds are provided if the vehicle is returned earlier than booked. You can only extend your hire after having collected the vehicle if you first obtain permission from the rental company. The rate for any such extra days (or late drop-offs) does not necessary have to be the same rate as that paid for the original booking and the payment is required immediately locally by credit card. If it is not returned at the booked depot or on/at the agreed date/time Avis Car-Away will charge a day’s hire for every unit of 2 hours delay. The renter is not covered by any insurance for this extended hire period in such a situation. This of course means that he/she is liable for any additional costs, fees and penalties that incur during this time. The rental company reserves the right to charge the renter for any loss of revenue incurred as a result of such delays in the return of the motorhome, e.g. if another customer is made to wait or miss out on their vehicle due to this delay. If the vehicle is returned with damage incurred the rental company will charge the appropriate fees in order to rectify the damage. It must be returned with a clean interior, and the toilets and waste water tanks must be empty. Otherwise, a cleaning fee of € 100 will be charged. It should also be returned full of fuel, otherwise Avis Car-Away will charge additional fees. The propane gas bottles do not have to be returned full. Avis Car-Away does not provide transfers so you are required to arrange your own transportation. The rental company can provide private transfers in Paris from the airport (Charles de Gaulle and Orly), Gare du Nord and other main stations in Paris or city hotels, in Ajaccio to the airport, train station, ferry terminal or hotels in Ajaccio area to the depot or from the depot to one of these places after drop-off, as long as this is requested on the same day that you make your booking with Motorhome Bookers. 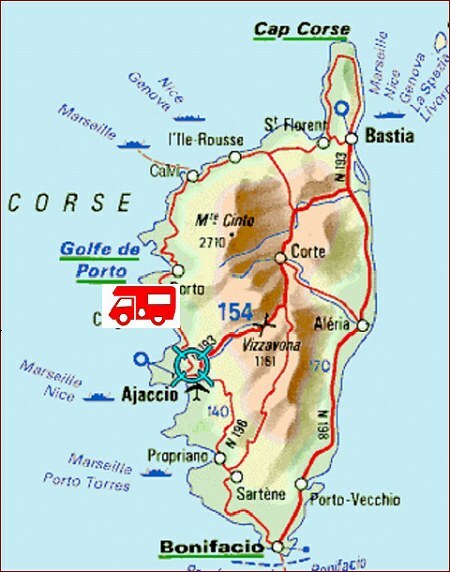 Transfers to/from Bastia, Figari, Calvi are also possible on request. This service is available for a fee as published during the online booking process. - Hotel details (name, address, phone number) if you are staying in a hotel prior to your motorhome pick-up. Otherwise, you will need to organise all transfers yourself. These transfers are only available between 0800hrs - 1500hrs. Due to possible traffic jams or slow-travelling traffic delays can occur so it is not possible to guarantee a specific transfer time. All Avis Car-Away rental depots allow you to park a private vehicle for the duration of your hire on request and free of charge. The vehicles are no older than 2 model years. Avis Car-Away will make every effort to ensure that the booked vehicle model is provided. However, the rental company reserves the right to provide a different or larger vehicle if the model booked is not available due to unforeseen circumstances or has been damaged by the previous renter. No additional rental costs will be charged in this case. If Avis Car-Away is forced to provide you with a smaller vehicle than the one you have booked they will reimburse the difference in price between the two vehicles. However, any additional costs such as higher petrol costs, tolls or ferry costs, etc will not be reimbursed. This does not give the renter the right to cancel his/her booking. NOTE: You will be guaranteed a vehicle from a certain category but not of any specific size, make, colour or design. Even though vehicles within a category have similar equipment, the design, size, measurements and floor plan (e.g. bed sizes or interior features, etc) may occasionally differ slightly within any given vehicle category. All measurements and size indications are approximate values and are based on the information provided to us by the rental company. We cannot accept responsibility for any mistakes made or human error in the provision of these details. Avis Car-Away can provide their PAI breakdown insurance for € 8 per rental day which gives you 24hr toll-free assistance with breakdowns or other problems with the vehicle. This is payable locally. For further information please see the section 'Insurance' above. In the event of an accident, breakdown, technical difficulties (including problems with tyres) or other problems you are required to inform Avis Car-Away immediately. If you have an accident, there is a fire or theft or you hit a wild animal, etc the police and the rental company need to be contacted immediately and any third party demands should not to be agreed to. In case of an accident the police report must include the name and address of the people involved as well as any witnesses along with the vehicle registration details of any vehicles involved. The PAI cover gives you a 24hr emergency hotline. Please note that if you have an accident, breakdown or technical difficulties in any East European country it can be more difficult to obtain prompt assistance than in other European states. Note: If you do not inform Avis Car-Away immediately and if the company is not given the opportunity to find a solution to your problem there will be no grounds for compensation. All Avis Car-Away vehicles undergo strict quality control. However, problems can still occur from time to time. For all repairs or expenses that are necessary to ensure the smooth running and upkeep of the vehicle you are required to inform the rental company before repairs take place in order to obtain their approval to proceed (otherwise no reimbursements can be provided). Repairs and necessary 'upkeep expenses' will only be reimbursed upon presentation of a receipt as well as the replaced parts - where the renter is not liable him-/herself for the damage. If you take out the PAI cover Avis Car-Away will reimburse you for any towing, transportation or rental depot relocation costs as well as accommodation costs (up to max. € 38 per person per day) as long as either the vehicle has incurred a mechanical breakdown* or an accident has taken place which are not the fault of the renter. *Mechanical breakdown: Damage for which Avis Car-Away is not required to give a reimbursement includes: problems with the radio/CD player, TV, video, microwave, air conditioning, fridge, appliances such as the oven, stove, etc., water pump, shower and toilet, cruise control and GPS. The cleaning of the vehicle exterior is included in the rental rates. You are still required to return the motorhome with a clean interior and the toilets and waste water tanks emptied by the time you drop off the vehicle. Otherwise, a fee of € 100 will be charged. You are required to return the vehicle with a full tank of fuel or further fees will apply. The gas bottles do not have to be returned full. Pets are only allowed in the vehicle with prior approval from the rental company. However, the vehicle must be returned in a clean state and free of animal smell/hair. Otherwise, special cleaning fees will apply. We (Motorhome Bookers Ltd) have compiled all information in as much detail as possible and on the basis of the information made available to us. This information has been taken from the rental company's conditions which they have provided to us. Any additional conditions are included in the rental agreement which is entered into by yourself and the rental company. You will receive the complete list of rental conditions with your rental agreement, which you sign when you collect your vehicle. We do not accept responsibility for any differences that may come to light between our list of conditions and the rental company’s most recent conditions. Drop-off points are flexible. Usually it is at the airport (long stay parking) or it can be at a hotel.